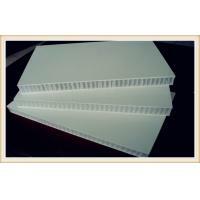 FRP Fiber Reinforce Plastic Plates Aluminium Honeycomb Panel with Wood Frame for Clean Room is a composite sandwiched aluminum honeycomb panel using the aluminum honeycomb core as the reinforcing core but the surface plates fiber reinforced plastics (FRP). A cleanroom or clean room is an environment, typically used in manufacturing or scientific research, with a low level of environmental pollutants such as dust, airborne microbes, aerosol particles, and chemical vapors. More accurately, a cleanroom has a controlled level of contamination that is specified by the number of particles per cubic meter at a specified particle size. To give perspective, the ambient air outside in a typical urban environment contains 35,000,000 particles per cubic meter in the size range 0.5 μm and larger in diameter, corresponding to an ISO 9 cleanroom, while an ISO 1 cleanroom allows no particles in that size range and only 12 particles per cubic meter of 0.3 μm and smaller. In the pharmaceutical industry, clean rooms play a crucial role in the manufacturing of pharmaceutical products which are required to be free from microbial and particulate contamination and required to be protected from moisture. Such pharmaceutical products are manufactured and manipulated in cleanrooms, which are fitted with HEPA and, if required, ULPA filters as well as dehumidifier systems.